When shopping for dinnerware, you will find that a 16 piece dinnerware set or five piece place setting is most common among the selections. Three piece place settings and 18 piece dinnerware sets are also somewhat common. It's good to know that usually, casual dinnerware sets are referred to using the "dinnerware set" terminology, and fine china is most likely sold in "place settings". Some dinnerware is actually sold in open stock, which means that you can buy dinnerware piece by piece to make up a set of your favorite dishes. Let's take a look at the most common ways that dinnerware is packaged. Generally, a 16 piece dinnerware set represents a set of dishes to serve four people. These are the most common in dinnerware casual sets. Most times, a 16 piece sets consists of four each of a dinner plate, a salad/dessert plate, a soup/cereal bowl, and a mug or cup. 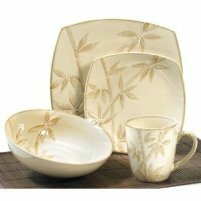 Casual dinnerware sets commonly have serving dishes sold as a completer set. This may include a serving platter, a vegetable bowl, and a sugar bowl and cream pitcher. Because casual dinnerware is often used a kitchen decor item, it is not unusual to find kitchen canister sets to match your dinnerware set. Sometimes you can even find glasses, kitchen towels, rugs, cutting boards and so forth to match a casual set. My first kitchen was darned with strawberry dinnerware made of stoneware. It came with a completer set that included a platter, a serving bowl, and sugar and creamer bowls. At that time, my Mom and I were into making ceramic dishes, so we made a lot of accompanying dishes, canisters and so forth and I had pink dessert glassware that I loved serving with. My second set was apple dinnerware. I had everything to match the dinnerware. It was the Apple Jack design by Ingleman Designs and there were many kitchen accessories available to match that pattern. 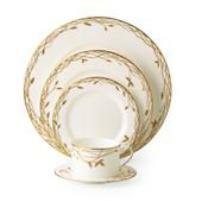 Fine and bone china dinnerware are most often sold in place settings rather than dinnerware sets. For instance, a five piece place setting may consist of a dinner plate, a salad plate, a bread plate, a saucer, and a teacup. These are the basic dishes for serving a formal meal to one person. Usually, with fine china, serving pieces are sold separately, as may be dessert dishes. Sometimes, the dishes are sold in open stock, which means you buy the dishes individually rather than in a set. That is beneficial to consumers who want to build a set of china gradually as their budget allows. Historically, the difference between casual dinnerware and fine china was related to the material that is used to make it. Casual sets mostly consist of ceramic dinnerware, glass dinnerware, or stoneware while fine china is most likely made of porcelain or bone china. However, it recent times, casual dinnerware sets are often made of porcelain.